The ever-popular range of Belfast sinks are among our best sellers, and it’s been this way since we launched in 2011. In fact, Belfast sinks have been in vogue since the 1700s, commonly found in kitchens of the landed gentry, and their strong aesthetic appeal has ensured they’ve remained fashionable for over 300 years. Its elegance lies in its simplicity. However, while Belfast's have long been associated with high-end interior design, the majority that we sell have far more practical purposes than being pleasing to the eye. 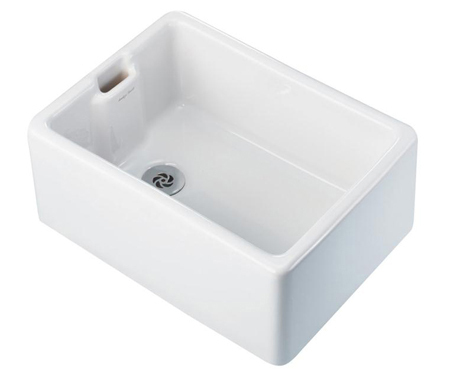 As a leading supplier of commercial sanitary ware, we frequently sell Belfast sinks to hotels, pubs, restaurants, schools (commonly used in art rooms), hospitals and veterinary surgeries. Our stainless steel Belfast sink, for example, is perfect for washing dogs! Why is a Belfast sink called a Belfast sink? Quite simply, as you may have guessed, the answer to this question is that Belfast sinks were originally designed in Belfast. They gained prominence in the eighteenth century and were an adaptation of the butler’s sink, which, as the name suggests, was primarily used by butlers; they were tasked with cleaning larger items, and a deep sink was required to do so efficiently. The key difference between Belfast butler sinks and others - commonly referred to as London sinks - was the introduction of an overflow weir (left-hand side of the above picture), which, it’s often said, was conceived said to prevent overspill, allowing water to drain away without the risk of flooding. However, we believe that ‘overflow’ is a slight misnomer, as it’s quite clear that the relatively small opening wouldn’t efficiently drain water away in the event of somebody forgetting to turn the tap off. The main purpose of the overflow weir is actually to let air into the drain when the sink is full, preventing a vacuum-effect that can result in slow draining. In days gone by, London sinks were shallower than Belfast sinks, the popular theory being that fresh water supplies were scarce in London, so excess water was actively discouraged, whereas Belfast had a more plentiful flow. However, some believe the real reason for the differentiation in size can be attributed to the sinks having different roles; London-style sinks were used in the scullery (washing dishes), and Belfast sinks were used in the butler’s pantry (the equivalent of a modern day utility room, where larger items were washed). Having said that, sizes can vary slightly due to the handmade, kiln-fired manufacturing process, which means every Belfast sink is inherently unique. It has been noted that Belfast sinks became so popular by the 1920s that they were often included in housing specifications. The added depth made them extremely practical for clothes washing and baby bathing, while the weir could easily be cleaned with a brush, preventing a buildup of germs in the drainage, which would have previously gone unnoticed, contributing to outbreaks of waterborne diseases. The best part of a century on, and Belfast sinks remain just as desirable in domestic settings as they are in commercial buildings. The bold rectangular artistry looks great at home, while the hard wearing enamel (or stainless steel) is perfect for heavy duty use, perhaps in busy restaurants or as a cleaner’s sink. The smooth, hard surface ensures they’re easy to clean, while they’re also heat and scratch resistant. The only word of warning would be that, glassware can easily smash when dropped into an enamel Belfast, so go careful when polishing your pint glasses. If you’re currently looking for the perfect sink for your premises, be sure to check out our Ultimate Buyer's Guide to Sinks, Basins and Wash Troughs. We’re always keen to hear more about the story behind our products and how they came into being, so if you have further information about the history of the Belfast sink, or indeed if you’d like to buy one, please email enquiries@washwareessentials.co.uk and we’ll get back to you as soon as possible.